Back in August, Twitter announced that it was getting ready to roll out an ambitious new project: Geolocation. The idea was to be able to attach a location to every tweet. Today, the API for the feature has been officially turned on, but location is not a part of the main site — yet. This means that applications that have been built using the APIs — such as Birdfeed, which we previewed recently — will be the first to be able to use location features. As Twitter notes, Seesmic Web, Foursquare, Gowalla, Twidroid, Twittelator Pro and a few others are also supporting location right now. As you can see in the screenshot, there is a new “Enable geotagging” option in the Settings menu on Twitter . It’s important to note that this feature is entirely opt-in. There is also a button to delete all your location data if you feel the need to do that. The process apparently takes up to 30 minutes to complete. 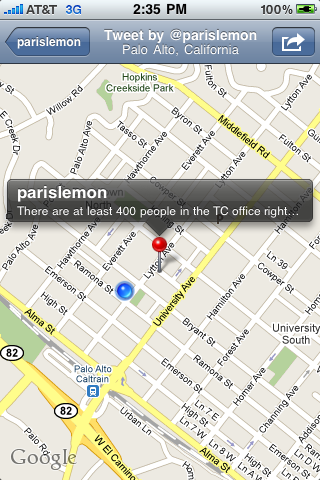 Location appears to be a big part of Twitter’s strategy going forward. Not only do they have the Geolocation API, but they have a new API to serve up better Trending Topics based on location. In his blog post, Twitter Platform Director Ryan Sarver notes, “This release is unique in that it’s API-only which means you won’t see any changes on twitter.com, yet.” “Yet” is the key word there. Given the extensive UI changes Twitter has undergone in the past few weeks with features like Lists and now Retweets being added, it shouldn’t be that surprising that Twitter is choosing not to roll this out on the main site right now. But you can be sure it will be a part of the experience eventually. 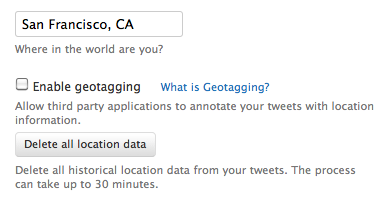 Developers interested in Geolocation should also look at the notes left today in the Twitter API Google Group. Twitter has a good sense of timing with this rollout as our Realtime Crunchup is taking place tomorrow in San Francisco, and Sarver will be a part of our panel talking about geolocation. It’s good that he now has something to talk about.